Preschool kids love crafts!! Crafts help kids develop fine motor-skills, hand-eye coordination, and other useful skills. Best of all, kids love creating. Here are a few crafts that are sure to spark the interest of your preschool child. 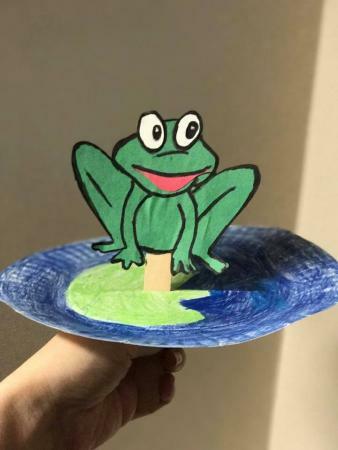 Turn an ordinary paper plate into a lily pad where your cute froggy friend can hop about. This project is not only fun to create, but it's fun to play with afterwards. Its a good craft to pair with the reading of the book, Frog and Toad or a story about a princess kissing a frog. Have child color the inside of the paper plate green to represent a lily pad. The child can color the rim of the plate blue to resemble water. Paint might make this step go faster, but then you will have to wait for it to dry to proceed. Have an adult cut a slit in the center of the paper plate that goes across from one side to the other (see image). This will allow the frog to hop from lily pad to water. Have the child draw a frog shape on the green paper and cut it out. An adult can draw one and have the child cut it out with safety scissors. Add white paper eyes or google eyes and a red paper tongue to the mouth. Glue the frog to the end of the craft stick. Put the stick end through the top of the plate and let the child watch the frog jump up and down on the lily pad. Anteaters are interesting creatures! 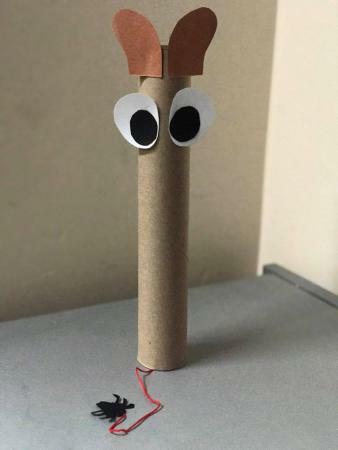 Create your own interactive anteater with simple craft items. Cut two white ovals out of white paper to create the eyes. Either cut black circles to put in the eyes (and glue them to the white ovals) or use a marker to create the look. Cut ear shapes out of brown paper (See photo for shape). Stack two sheets of brown paper together before cutting to assure symmetry. Glue the ear shapes to the top front of the paper roll. Cut an ant shape out of black paper. Tape the ant to one end of the red string. 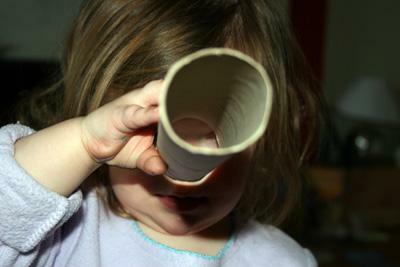 Cut a small slit on the top of the paper towel roll, opposite side from the eyes. Slip the red string through the tube with the ant hanging out the bottom. Slip the other end of the string into the slit at the top of the roll. Children will enjoy helping the anteater "eat" the ant by pulling the sting up through the tube. Everyone, especially preschool children, love puppies. Teach them about puppies or help a story come alive by helping them create puppy paw gloves. Cut a small semi-circle off the bottom of the four paper plates (see photo). 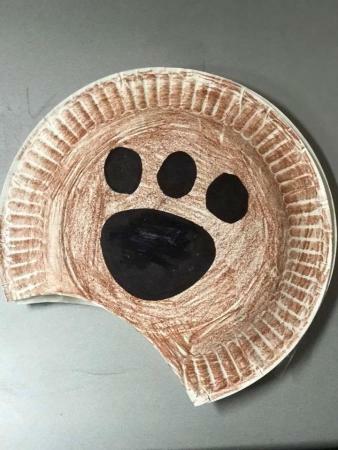 Color the bottoms of two of the paper plates to resemble the fur of a puppy. Let the child choose the color. If you want to add texture, glue cotton balls, yarn, or fun fur. On the bottom of the other two plates, draw paw prints using crayons or markers (you could also use paint). Staple the paper plates together (putting inside of plate to inside of plate). Have the child slip their hands into the paw "mittens" and pretend to be a puppy. You can use this craft with any type of animal print including birds, bears or horses. If you are looking for more preschool craft ideas, there are plenty to choose. Preschool Spring Crafts - Here you will find colorful, spring theme crafts including a coffee filter butterfly and Easter projects. Christian Easter Crafts - Celebrate Easter with a variety of projects including some commercial kits to order. Kid's Bee Crafts - These crafts are also perfect for springtime fun and include fingerprint and handprint projects. These crafts would work great for a bee unit of study. American Flag Crafts for Kids - Whether you're celebrating the Fourth of July, Memorial Day, or Flag Day, these American flag related crafts will please your youngsters. Fall Crafts for Preschoolers and Kids - These projects are great for autumn time fun for preschool kids and include an acorn picture frame, leaf book, and scarecrow. Christmas Craft Ideas for Kids - Celebrate the holidays with these ornaments, candy crafts, and other projects that could even be used as a gift for a special family member or friend. Ladybug Crafts for Kids - Let your love bug's imagination go wild with this ladybug themed slideshow that shows a variety of projects including a painted rock ladybug. Fire Safety Crafts for Kids - These fire safety crafts will help youngsters learn more about fire safety. They will learn how to make their own firefighter's hat, 911 poster, and other crafts. Ability level of children this age can vary greatly so be sure to be prepared to provide help if the projects become too difficult for the child. It is also wise to be prepared by having all the supplies in order prior to presenting the craft idea to the preschool child. They tend to have short attention spans and may lose interest in the project early if they are made to wait too long.